I love this appetizer idea from Family Fun for Thanksgiving dinner. 1. Give each child a tortilla cut in half. 2. Roll the tortilla into a cone and secure with a toothpick. 3. 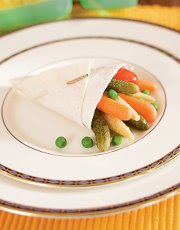 Have your child fill the tortilla with veggies from the veggie tray. 4. Serve with dip or dressing.